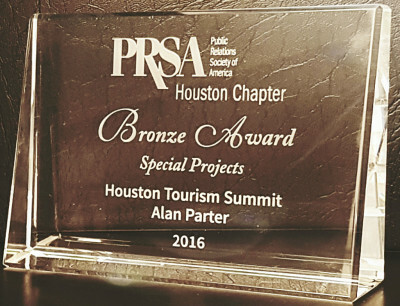 Parter International, Inc. was a recipient of the Bronze Award in Special Projects for its work regarding the First Houston Tourism Summit held on September 10th 2015. The award was presented by the Public Relations Society of America Houston Chapter at the 2016 award event. The Bronze Awards have celebrated the “best of the best” in public relations in Houston and recognize outstanding contributions to the success of an overall program or campaign. The initial Houston Tourism Summit was a full day event that attracted over 500 attendees, and had 26 speakers from around the U.S. who were experts and thought-leaders in their respected tourism specialties. The success of this event continues as the September 2016 Tourism Summit attracted 17% more attendees than the first year's event. PRSA Houston is one of the nation's largest and most active chapters of the Public Relations Society of America. Founded in 1950, PRSA Houston focuses on helping members become more valuable to their organizations and clients, and therefore become more successful professionally.